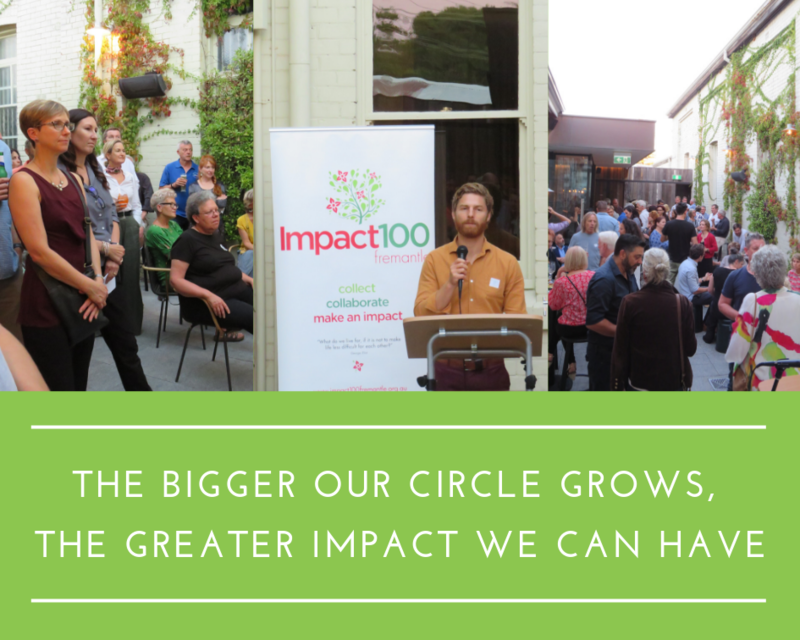 Thank you to everyone who joined us at last week’s Launch for Impact100 Fremantle 2019, and a special thanks to those who donated or pledged on the night. In six years our giving circle has granted $705,000 to local projects and organisations in Fremantle and we are excited to continue growing. If you haven’t already, we would love you to donate or pledge your support to Impact100 Fremantle. In 2019, Impact100 Fremantle is inviting organisations and projects that work on improving the health and wellbeing of our community to apply. activities – such as the arts, cultural or health based programs. demographics – such as young people, the aged or by gender, racial or cultural grounds. causes – such as mental wellbeing, homelessness or social isolation. For more information about the Application Process please refer to our 2019 Expression of Interest Guidelines. The bigger our circle grows, the greater impact we can have! Donors choose the grant recipient collectively at an Annual Awards Night. Did you know you can now make 10x monthly instalments of $100 donations or choose to donate $1,000 in one go? Alternatively, you can pledge your support to Impact100 Fremantle now and pay at a later date. Pledging to Impact100 Fremantle 2019 now helps us calculate our donations total and know how far we are from reaching our granting total. If you would like to PLEDGE NOW for Impact100 Fremantle and PAY LATER please click on the button here. If you would like to give to Impact100 Fremantle 2019 as part of a group or workplace please contact our Social Impact Manager, Hannah Fitch-Rabbitt, who can assist you to make this easy for each member of your group to donate. So join us, and become a part of Impact100 Fremantle today. Together we can make an impact. We would like to thank Siobhan, Hamish and the entire team at Guildhall Event Space for kindly hosting (and dining) us last Thursday, and also Blue Cow Cheese Company for their contribution.